Each year, we ask roasters to send us exceptional coffees available only during the holidays, coffees that might make particularly gratifying gifts or splurges for coffee-lovers. In past years, approaches have ranged from particularly fine lots of classic coffees that roasters reserved for the holiday season, to rare and often expensive seasonally available micro-lot coffees, to ingenious and original one-time-only special blends. For this report, we tested 60 samples from 46 roasters across the U.S. and from Canada and Taiwan. Thirteen coffees, ranging in score from 93-96, emerged at the top of our list and are reviewed here. We’ve divided them into three groups: special holiday blends, rare and unusual seasonal coffees, and perennial classics. The three top-rated holiday blends were roasted in diverse parts of the world and took divergent approaches to the “holiday” theme. Red Rooster Coffee Roaster, in the hamlet of Floyd, Virginia, each year asks head roaster Tony Greatorex to create two special holiday blends: one a lighter-roaster “Sweet Holiday Blend” and a second, slightly darker-roasted “Bold Holiday Blend.” While the latter scored a solid 91, we chose to review the 93-rated Sweet Holiday Blend. For the past three years, the base of this blend has consisted of two Ethiopia coffees, one natural-processed and one wet-processed (this year a Banko Gotiti and a Konga, respectively). This year, Greatorex added a wet-processed Colombia Bilbao Del Rio “for chocolate creaminess” and a Kenya Nyeri Kiruga “for a bit of zesty pop.” The blend is packaged in an attractive bag designed by Josh Gibson, a Roanoke-based artist. The Sweet Blend also represents a good holiday value at $14.99 for 12 ounces. Red Rooster, by the way, also earned the #13 spot on our list of the Top 30 Coffees of 2017 with an espresso blend. Flight Coffee’s Yule Blend (94), roasted in Bedford, New Hampshire, is an exercise in subtle blending. It is composed of two coffees, both Kenyas, from a pair of highly regarded cooperatives, Kamwangi and Kainamui. Both blend components were produced from trees of the SL28 and Ruiru 11 varieties of Arabica and processed by the meticulous Kenya wet method. The result, roasted by Jake Ryder, is rich with berry and spice notes and deeply sweet-savory in structure. It represents another good value at $15 for 12 ounces. Roaster Yu Chih Hao working in Fumi’s lab in Taiwan. Courtesy of Fumi Roasting. From Taiwan, we review roaster Yu Chih Hao’s Fumi Holiday Blend (93), a complex juxtaposition of two Ethiopia coffees (a wet-processed Banko Gotiti and a natural-processed Yirgacheffe Aricha), a honey-processed Costa Rica, and a wet-processed Panama Elida Chiriqui. It’s available for shipment anywhere in the world from Fumi’s Facebook shop. The current brilliant surge of innovation among coffee producers worldwide contributed several unusual and distinguished coffees to this month’s holiday array, including two from rare varieties of Arabica, another arrived from a revived and newly emerging growing region, and one so original in cup character that we were baffled when we attempted to assign a rating to it. Among coffees distinguished by variety, the honey-processed Pacamara from Los Congos (93), a farm in the Nueva Segovia Department of Nicaragua, was roasted by Tamas Christman of Dragonfly Coffee Roasters in Boulder, Colorado. (Dragonfly also placed two coffees in our 2017 Top 30 list, #1 and #9). The Pacamara variety is a cross between the giant-beaned Maragogipe and Pacas, a selection of the heirloom Bourbon, and is admired for its uniquely savory depth. This version offers sweet and savory in resonant balance. 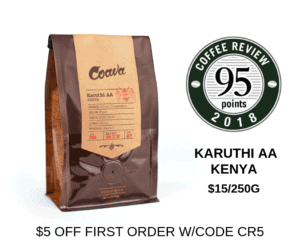 OQ Coffee in Highland Park, New Jersey, sent an intriguing Sudan Rume (93) produced by Coffea Diversa in Costa Rica, a farm that grows more than 600 different coffee varieties, species and cultivars, and currently offers eight of them to roasters. Sudan Rume is an ancient variety of Arabica originally selected from wild trees growing on the Boma Plateau of Sudan, close to the border with Ethiopia, in the general region where the Arabica species is thought to have originated some 200,000 years ago as a spontaneous cross between two less flavorful coffee species. As presented by OQ at $28 for eight ounces, it’s a modest splurge that should please aficionados with both its botanical story and its cup: bright, crisply sweet, alive with notes of honey and lilac. While a number of interesting coffees have reached us recently from the Democratic Republic of the Congo, quality has tended to be a bit uneven. But for this report, Speckled Ax sent a certified-organic coffee produced by Virunga Coffee, which began collaborating with local cooperatives in 2011 to improve the quality of coffee production in this emerging growing region in the far east of the Democratic Republic of the Congo, across Lake Kivu from Rwanda. At a score of 93, it’s one of the finest Congo coffees we’ve tested recently, and its organic certification adds value for many consumers and gift-givers. $17.00 will buy 12 ounces of coffee redolent of savory-sweet fruit notes, high-toned florals, and a hint of pipe tobacco. We tested one additional rare coffee that we would like to note and recommend, though we found it difficult to formally rate. Dragonfly Coffee Roasters’ 90+ Gesha Estates Panama Limited Batch #236 Jose Alfredo Process is an enigma, even to its roaster, Tamas Christman. At $165 for eight ounces, it’s an experience reserved for the most curious and adventure-seeking of palates. A gift of this coffee is akin to giving a collector of French wines a bottle of Richard Leroy’s Loire Valley Chenin Blancs. Like Leroy, a wine game-changer with his renegade viticultural and processing methods, Joseph Brodsky (owner of Ninety Plus Estates) and his general manager Jose Alfredo appears to be aiming at reinventing specialty coffee with experimental (and so far secret) processing methods that radically elaborate on the already striking aromas and flavors generated by the celebrated Gesha variety Brodsky grows on his farms. Three of us cupped this coffee. In fact, we cupped it several times. The main difficulty in evaluation we faced when attempting to assign a rating to it involved the general concept of taint. Taint is a bad word in the coffee world. The traditional definition of taint is any cup characteristic created by fruit removal and drying that causes a coffee to deviate from the clean, bright, classic cup profile generated by the traditional wet or washed method of processing. By this definition, many popular coffee types dried inside the whole fruit by the “natural” method present as too lushly fruit-forward, hence, “tainted.” A more flexible definition of taint focuses on irregularities within a given lot of coffee. In other words, if a processing variation adds a cup characteristic to a coffee that is consistent throughout the entire lot, many argue that it cannot be considered a taint, but simply a characteristic associated with that particular coffee. Of course, some may choose not like that characteristic, but if it represents a consistent and presumably intentional creative act by the producer, many of us also feel we have no business dismissing a purposeful sensory variation with the blanket derogatory term taint. In this case, at the pure end of the coffee sensory spectrum we named no fewer than 10 fruit and floral notes in aroma alone, including lychee, loquat, jackfruit, kumquat, star jasmine, plumeria and lavender, all wrapped in rich cocoa. But at the ambiguous end of the spectrum, enveloping and complexly interacting with the more conventional notes, a deep sweet ferment displayed, a sensation that I finally called “grappa barrel.” There were also notes invoking aged cheese, not something one typically associates with coffee. When I closed my eyes and fully took in the aroma alone, poi (fermented taro) also came to mind. Lastly, there was aromatic wood, so perfumed as to suggest incense, perhaps myrrh. So, this coffee is a brainteaser, a paradigm-challenger, an invitation to meditate rather than rate. We see exemplary versions of classic coffees throughout the year, but during the holidays, particularly fine examples appear on roasters’ offering lists. The seven samples we review this month and categorize as classic were produced in Kenya, Panama, El Salvador and Ethiopia. All are superb demonstrations of how careful coffee selection and roast-profiling can bring out the best in familiar, yet distinguished coffee types. The top-scorer in this category, and in this entire report, was Willoughby’s Coffee & Tea’s Panama Gesha Natural (96), produced by farmer Roberto Brenes of Auromar Estate in the Chiriqui Province of western Panama. This complex, uniquely sweet version of the great Gesha profile evokes the tropics, in particular, with notes of mango and plumeria. It is a bit of a splurge at $55 for a 12-ounce bag, but it’s a singular experience of coffee, an exquisite gift for the coffee-drinker who’s tried (almost) everything. This coffee appears at the #8 spot on our 2017 Top 30 list (a Willoughby’s coffee took the #7 spot as well). Equator’s Ted Stachura cupping with Wilford Lamastus at Elida Estates in Panama. Courtesy of Equator Coffees & Teas. Equator Coffees & Teas (a women-owned roaster that made the 2017 Top 30 list with a Sumatra) is offering a lovely Panama Elida Green Tip Gesha Natural (94), produced by Panama’s Lamastus family at their famed Elida Estate. This spice-toned, cleanly fruit-laden natural-processed cup, sold in small four-ounce bags for $37, offers an attractive option for those who want to splurge on a particularly celebrated and striking holiday coffee, yet keep the budget under $50. Bird Rock Coffee Roasters’ El Salvador Finca Kilimanjaro (rated 95; #16 on our 2017 Top 30 list) was produced by El Salvador’s famed Aida Batlle. It is comprised entirely of coffees from trees of the SL28 variety of Arabica, the variety responsible for Kenya’s finest coffees, and is a steal at a discounted price over the holidays of $25 for 12 ounces. Greenstone Coffee’s booth at Taipei’s annual coffee show. Courtesy of Greenstone Coffee. 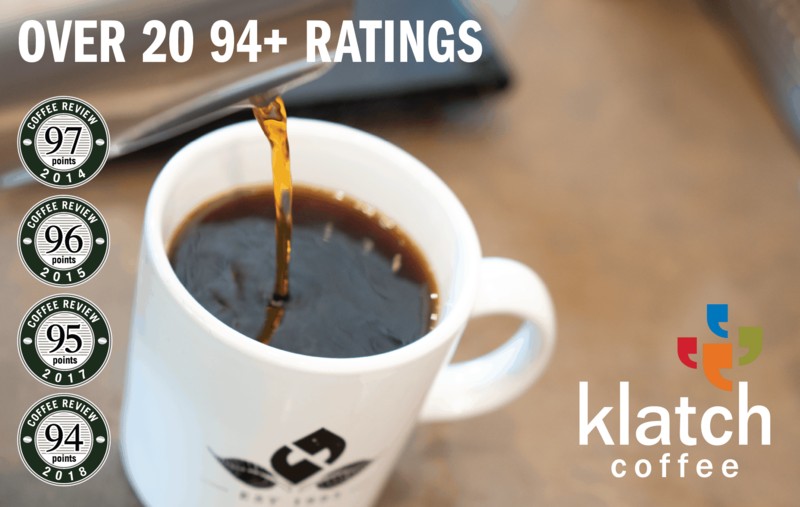 Greenstone Coffee’s washed version of an Ethiopia Banko Gotiti earned the #23 spot on our Top 30 list; the natural version is reviewed here at 94 as a holiday coffee. A woman-owned roaster in Taiwan, Greenstone sells coffee via its Facebook page. Roaster Kelly Wang admires this coffee for its expression of the clean, pure fruit tones she associates with the holiday season, though she admits she’s a year-round fan of natural-processed coffees from Ethiopia. Eric Palumbo says of Cimarron Coffee Roasters’ Kenya Riakiberu AB (rated 95 here and #20 on our 2017 Top 30 list), “When I first tasted the Riakiberu, the primary notes brought to mind the cranberry salad my grandmother and mother always made around the holidays. It was sweet with sugar and marshmallows, tart with cranberries, floral and tangy with orange zest and creamy with whipped cream.” And it’s just $14 for 250 grams. The roasting operation at Good Folks Coffee in Louisville, Kentucky. Courtesy of Good Folks Coffee. And that’s what we wish for you and yours this holiday season: lovingly crafted coffees, among many other pleasures.